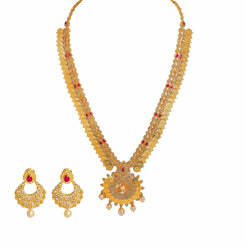 22K Yellow Gold Diamond Necklace and Earrings Set W/ 14.24ct Uncut Diamonds, Rubies, Pearls & Clustered Flower Designs for women. 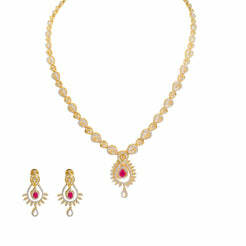 This radiant yellow gold set is encrusted with 14.24ct uncut diamonds, precious rubies and hanging pearls. It has a display of clustered jeweled flowers grouped with yellow gold cuffs. The necklace is 15" long with a width range of 2.5-10 mm. Its pendant is 35 mm long and 21 mm wide. Each earring is 34 mm long and 17 mm wide. 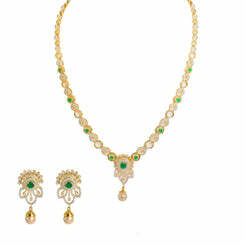 This exquisite set has a total gold weight of 45.1 grams.